Welcome to the November Edition of the SoapBox! First we want to thank all our Donation Nomination participants for sharing their stories with us. Learning about and helping support these wonderful organizations has been a highlight for all of us working on the SoapBox, and we couldn’t do it without you. Next month we have big, BIG news. We have an offer that has never been provided before. The only hint you’ll get are these four names we think you’ll recognize! Stay tuned next month to see what we have in store! This month, we dive deeper into the technological revolution in the Fitness and Health Club industry with Bryan O’ Rourke. Indeed Kurzweil is correct the pace of change is exponential and not linear and therefore the rate of change resulting from technology is accelerating and most leaders do not gauge the impact this will really have. As a result technology sneaks up on us, revolutionizing industries, wrecking havoc on the unprepared while creating glorious opportunities for others. The fitness and health club industries are no exception. Consider that the modern “health club” industry is only about 50 years old. A lot has changed in the past five decades and the implications to our industry,as a result, are tremendous. Today we live in a world of constant connectivity, mobile networks, ubiquitous sensors and other technologies that did not exist only a decade ago. 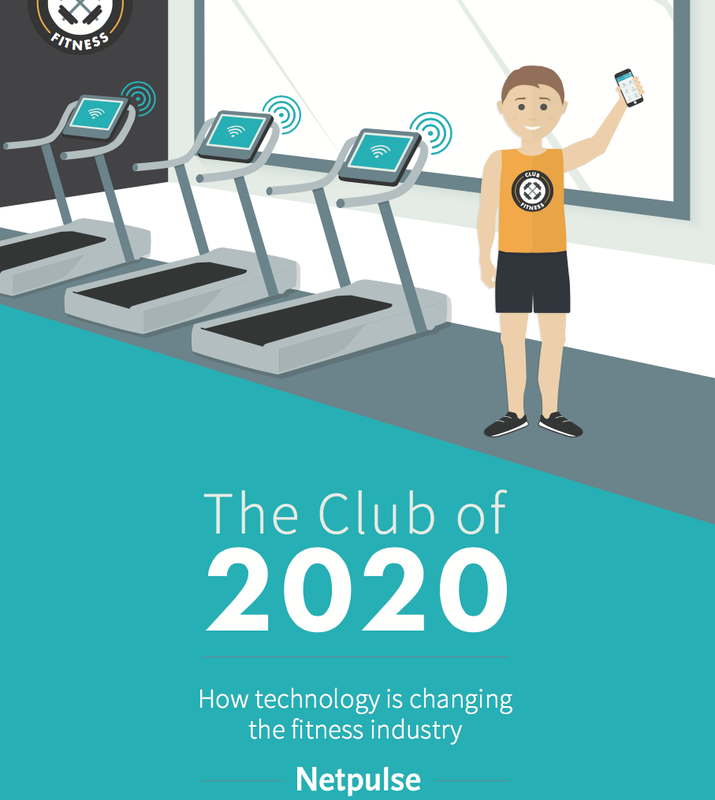 Netpulse recently created a great report on the health club of 2020 which demonstrates some of the implications of these technology trends. Access to information about people’s behaviors from sleep and activity levels to mood and food consumption is available 24 hours a day 7 days a week. Consumers in general are becoming accustomed to solutions and services based on advanced technologies in other industries and they will expect this from fitness and clubs increasingly. Given these realities and what is to come fitness professionals must reconsider everything about their business models not because they should but because their very survival and ultimate success hangs in the balance. Looking at the music industry is instructive when considering how technology is and will revolutionize fitness and health clubs. The advent of MP3 technology completely changed how people enjoyed music, how it was sold and how musicians could publish their work. Some in the music business still think, however, that a decade of iTunes singles, which digital music made available, killed the music industry. Those that think this way were the “pigs at the trough”, making profits on an inefficient distribution model which rewarded a few at the expense of others. They are the naysayers and pessimist who did not see the silver lining in the dark clouds. By un-tethering music from a rigid distribution model around proprietary formats, music enjoyment and sales exploded. From 2000 to 2010, global growth in live performances and album sales both tripled. The new digital music environment and industry creates opportunities previously unimaginable. Technology grew the pie substantially and will continue to do so for the music business. Parallels exist in health, fitness and wellness. We see the industry tripling in size in the next decade as a result. Ultimately technologies are great enablers of innovation. During a recent speech at the 2014 HCI-DC conference, author Malcolm Gladwell shared his thoughts, which fitness professionals and leaders need to keep in mind, “Sometimes when we look at innovation we make the mistake of thinking that innovation is specific to an individual invention or device. But all of those [individual] views miss the greatest transformation that’s brought about by technology — and that’s when you bring these various pieces and have them work together in combination — it’s the synergies between these tools that bring about the greatest changes in the world that we live in.” When evaluating the impact of technology on the health, fitness and wellness market professionals must integrate these evolving tools into their innovation efforts because they have the potential to significantly increase the number of people that can be engaged and serviced to adopt healthier lifestyles. A new world of innovation is emerging in the health club and fitness space right now and substantiates the tsunami of change that is upon our industry. Pure digital service models that provide on-demand coaching like Rise are in the marketplace. Class Pass, which has obtained over $50 Million in venture capital, is now a global mobile booking business for studios, and it did not even exist three years ago. Soul Cycle with its robust mobile app is delivering an outstanding digital – physical consumer experience around their cycling offering. Meanwhile, the Internet of Everything is driving adoption of low cost connectivity to monitor equipment with solutions like www.myecofit.com, delivering member intelligence and ultimately improving user experience. How can brands adapt in this current environment of change brought on by technology? A recent report presented by technology solutions provided by Club Excerp, a leading enterprise software provider, addresses this when referencing the role of the CIO in the health club industry (read it here). It includes some compelling thoughts from health club leaders in Europe on the subject of technology and its implications. Organization needs leadership that understands the potential available through technology but more importantly that potential must be defined around the member experience. Brands need the right partners who understand this new era of technology and can share meaningful insights, advice, options and thoughtful paths to solutions. We are seeing major fitness and health club brands trying to reorient their models or launch completely new models in order to address a changing landscape where consumer experience will determine success or failure. Regardless of the industry, business model or organization, technology is revolutionizing everything. The fitness and health club industries are no exception. Ultimately technology will grow the marketplace significantly. It is essential that leaders dial into key trends and reflect on their business models and the implications of technologies to their customers. The future belongs to the brave who have a vision of how to make things better using new tools. To be successful in the fitness and health club industry you must be brave and take advantage of the future that has already arrived. Our industry and its success depends on it. If I can be of any help to you or your organization please let me know via bryan@integerus.com. About the author: Bryan O’Rourke is an experienced CEO, strategist, and adviser who helps organizations and professionals realize their full potential and solve their biggest challenges. With a track record of building teams and growing global brands, his network of associates and partners have served organizations large and small. His present focus is on fitness, wellness, health clubs, technology, innovation, finance, marketing and business development, but his expertise and consultancy extends to a number of disciplines and industries. He is an owner and CSO of Fitmarc, which serves over 1,000 fitness facilities and over 5,000 instructor professionals. As President of the Fitness Industry Technology Council, he is working to create interoperability standards in the fitness space. He is considered a leading expert on technology, consumer and business trends and his views have been published in periodicals like the Wall Street Journal, the New York Times, Inc. Magazine, and CBI among others. Bryan delivers customized keynotes and strategic working sessions and is a highly sought after speaker and facilitator who has delivered his message at industry conferences and organizational events on four continents. Via his firm Integerus, Bryan advises a number of high profile entrepreneurs, their families and leading brands on a host of business matters both domestically and internationally. To learn more visit bryankorourke.com. Featured Petra Product of the Month! Next Next post: Merry Christmas! Our gift to you: free expert consulting!